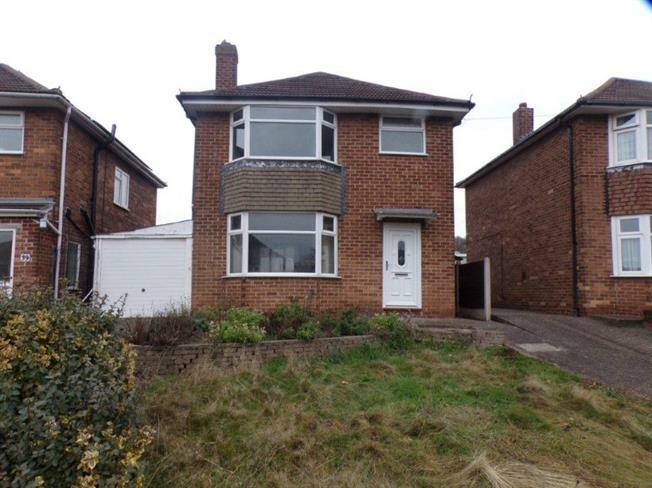 3 Bedroom Detached House For Sale in Burton-on-Trent for Offers in the region of £185,000. A rare opportunity has arisen to purchase this three bedroom detached dwelling with the benefit of UPVC double glazing, but which otherwise needs modernisation. The accommodation briefly comprises of new UPVC front door leading to entrance hall, Lounge diner, kitchen and rear lobby, upstairs it has three bedrooms and bathroom. To the outside of the property it has front and rear gardens, driveway leading to tandem garage. The modernisation of the property mentioned is reflected in the low guide price. New Entrance door leading to entrance hall with stairs to first floor, doors to ground floor rooms and parquet flooring. UPVC bay window to the front elevation, radiator and window UPVC window to the rear elevation, parquet flooring and stone fire place. Window to the side elevation and adjoining the rear lobby area, door to lobby and under stair pantry cupboard. UPVC side entrance door leading to lobby with door to kitchen. Landing with doors to all upstairs rooms and UPVC double glazed window to the side elevation. UPVC bay window to the front elevation, fitted wardrobes and radiator. UPVC double glazed window to the rear elevation, fitted wardrobes and radiator. UPVC double glazed window to the front elevation. Having up and over door to the front elevation and door to the rear elevation.